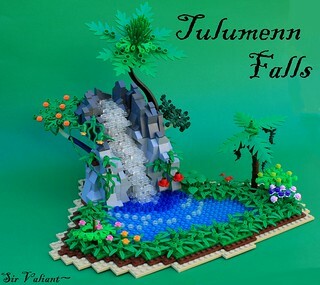 I would like to present you my newest MOC: Tulumenn Falls. It began as me shaping the waterfall and then building the landscape up around it. I wanted to get a deep forest feel and I think I achieved it well. If you have any C&C it is welcomed. That's an interesting technique with the bush coming out of the tree, I don't think I've seen it before. It works well, though, nice job! Quite pretty, I really like it! I can see this fitting well in a deep forest clearing- very well done!